There are many reasons to move to Edinburgh. The streets are steeped in history. The vibrant culture that comes to a world-class peak in August. Restaurants. Attractions. It’s the perfect place to live as far as I’m concerned. While these are all fine and well – there’s another biggie I’d be barking mad not to tell you about. Edinburgh has got some seriously impressive places to walk your dog. In 2013, when I moved to Edinburgh I was aware of the city’s beauty. However, I was not aware of all the great walks in and around Edinburgh and how close to my front door they all were – until I got a dog. I must admit (probably a lot like other dog owners), in winter it is very easy to nip down to the local park for a quick run around. However, on the longer summer evenings and at weekends, I like to explore further afield for both my enjoyment as well as the dog’s. So, I am going to talk you through my top five favourite dog walking spots in and around Edinburgh. Let’s start with a bang. They don’t come much bigger than an extinct volcano! This volcanic rock formation, known as Arthur’s Seat, provides hours of four and two legged fun with a multitude of paths and, once at the top, the stunning city view is well worth the walk. 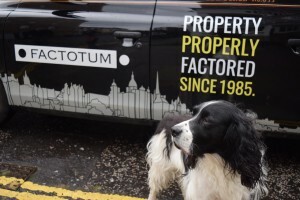 Factotum’s Top Tip: Trek up the rocky rise of Salisbury Crags, or summit Whinny Hill for a cityscape that will leave you and your furry pal speechless. My second vote goes to Corstorphine Hill. This walk which overlooks Blackhall, Murrayfield, Balgreen and of course, Corstorphine is great any time of year and easy to get to by driving or by hopping on the number 26 bus. This great walk has multiple paths on offer. On the top of the hill you will see Corstorphine Hill Tower, a monument dedicated to Sir Walter Scott. Factotum’s Top Tip: Take a flask of coffee and perch yourself down while the dogs play. Of course I have to include a beach because all dogs love running in the sand, right? My third choice is Cramond Beach as it is easily accessible and by far my favourite running spot overlooking the Firth of Forth. However, if you want to take it a bit slower I can suggest a lovely stroll along the beach and when the tide is out, over to Cramond Island. Factotum’s Top Tip: Take extra tennis balls to replace the ones that get lost in the sea. My fourth choice of walk will now return us to the city centre where you can join the Water of Leith walkway from Canonmills. Only after (of course) getting a takeaway coffee from the Blue Bear Cafe. You can stroll along the river into Stockbridge and further on to the iconic Dean Village. However, the path separates, allowing for further exploring in and around Stockbridge. Factotum’s Top Tip: Take your time walking alongside the river. There is plenty of wildlife to see. This park has been my go-to park for any dog walk meet-ups. The park is a great place to exercise both yourself and your pooch as there are multiple exercise devices on the perimeter. Factotum’s Top Tip: Walk the whole park and don’t just cut through, there is always another furry friend your dog will want to play with. I could talk for days about dog walks in Edinburgh but I think it’s time for you to explore for yourself, so go get your walking boots on, get your dog and explore one of the most picturesque cities in Scotland.